When your chimney twists and turns, the Kingsman Z58HSK5 Horizontal Flex Vent Chimney Pipe Starter Kit can help the smoke navigate its way out of the house. As with all of Kingsman products, this Horizontal Flex Vent Chimney Pipe Starter Kit is manufactured with quality materials and is designed to fit into your home's unique design. The kit includes all the items you need, including 5 feet of flex pipe, a chimney termination piece, and a wall thimble. 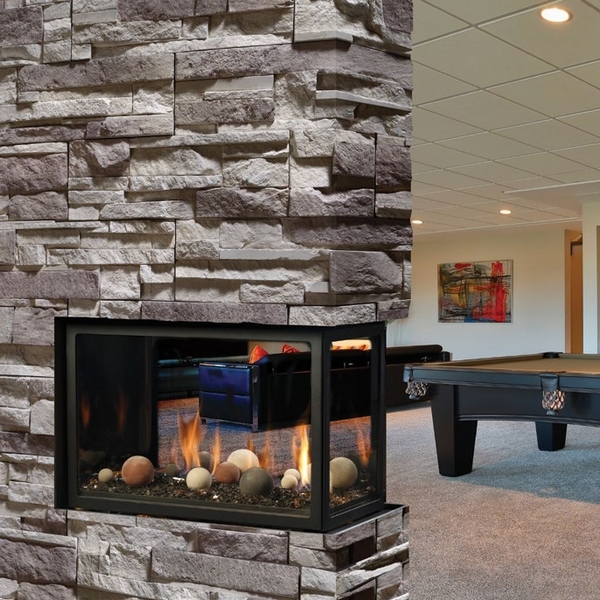 Whether it's time to reline your chimney or you're putting in an entirely new fireplace and chimney, Kingsman has the products that you need for a quality fireplace! Sometimes your chimney just isn't the "right" shape for a typical vent system. That's where the Kingsman Z58FK5 Flex Chimney Pipe Kit comes in handy. This Flex Kit is designed to be used as a part of the Horizontal Vent Starter Kit for 5/8" Chimney Collection. The kit measures 5" by 8" in diameter and measures 5' long when stretched. It comes with all the necessary springs, screws and a mill pac - all the parts needed for successful installation. No matter what kinds of twists and turns your chimney may have, you can still enjoy a cozy fire in your beautiful fireplace on a chilly winter evening! Sometimes your chimney just isn't the "right" shape for a typical vent system. That's where the Kingsman Z58FK8 Flex Chimney Pipe Kit comes in handy. This Flex Kit is designed to be used as a part of the Horizontal Vent Starter Kit for 5/8" Chimney Collection. The kit measures 5" by 8" in diameter and measures 8' long when stretched. It comes with all the necessary springs, screws and a mill pac - all the parts needed for successful installation. No matter what kinds of twists and turns your chimney may have, you can still enjoy a cozy fire in your beautiful fireplace on a chilly winter evening! Sometimes your chimney just isn't the "right" shape for a typical vent system. That's where the Kingsman Z58FK20 Flex Chimney Pipe Kit comes in handy. This Flex Kit is designed to be used as a part of the Horizontal Vent Starter Kit for 5/8" Chimney Collection. The kit measures 5" by 8" in diameter and measures 20' long when stretched. It comes with all the necessary springs, screws and a mill pac - all the parts needed for successful installation. No matter what kinds of twists and turns your chimney may have, you can still enjoy a cozy fire in your beautiful fireplace on a chilly winter evening! Tired of having your nice living room filled with ash deposits and soot? Embarrassed to have company over? Kingsman has just answer to your problem. The ZDV5FC chimney vent is just the thing to keep your belongings free of dirt. This chimney vent is equipped with a flex connector that measures five inches in diameter. This handy vent will not only keep your living room from being damaged, but is also flexible enough to keep from being easily damaged itself. The Kingsman ZDV5FC chimney vent is just the thing you need to complete the use of your soot and ash free living room. Tired of having your nice living room filled with ash deposits and soot? Embarrassed to have company over? Kingsman has just answer to your problem. The ZDV8FC chimney vent is just the thing to keep your belongings free of dirt. This chimney vent is equipped with a flex connector that measures eight inches in diameter. This handy vent will not only keep your living room from being damaged, but is also flexible enough to keep from being easily damaged itself. The Kingsman ZDV8FC chimney vent is just the thing you need to complete the use of your soot and ash free living room. With any chimney, the essential parts are necessary to keep it functioning. Kingsman specializes in making sure that you have quality parts for a quality chimney. With parts from Kingsman such as the ZDV5FCL flex clamp, your chimney is sure to exceed every expectation possible. This clamp is 5 inches in diameter. Although the chimney or chimney vent isn't included in this purchase, these items are available for individual sale. Enjoy a quiet evening with a hot beverage in your hands sitting by your completely functioning fireplace, knowing that it is completely functioning due to the utilization of Kingsman chimney parts. 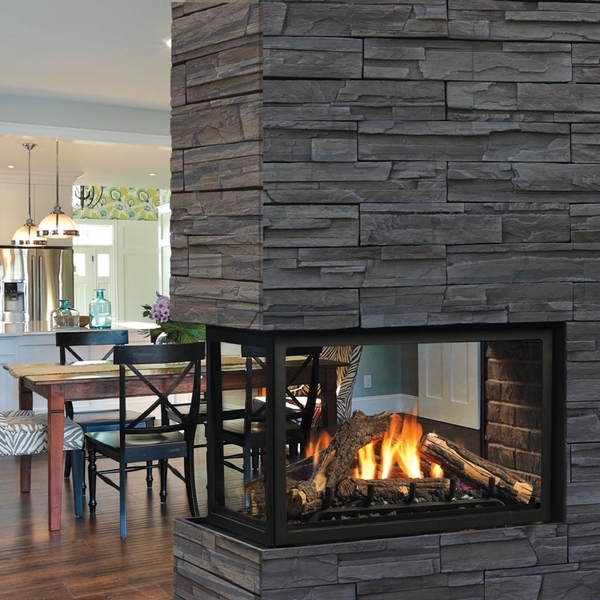 When you're looking for chimney termination options, Kingsman Fireplaces has some of the best. Not only does this company offer quality products, but they also offer products which improve the aesthetics of your home. This Kingsman Z58HT Round Horizontal Chimney Pipe Vent Termination provides a circle termination for your chimney. When it's time to install a fireplace, the beautiful exterior within your home offers a lovely centerpiece and the outer part of the chimney adds a nice pop to your roof. With this product you'll have a simply beautiful round horizontal chimney pipe vent termination for the exterior of your home. Are you tired of not being able to enjoy the smell of fresh air in your house? IS there a constant thickness to the air in the living room in particular? Kingsman can help solve your problems! Kingsman provides gas and standing stove parts to help you gain the best use out of your stove or fireplace. The Z58WTS horizontal wall thimble is a shield for low enclosures and helps traps any unwanted particles in the air. This is only one type of enclosures that Kingsman provides. Other ventilation accessories are available for separate purchase. Don't waste another moment; look into Kingsman products right away! Homeowners throughout the United States and Canada have trusted Kingsman Inc. with their fireplaces for over thirty years. When shopping with Kingsman, any homeowner knows that they will receive the best materials and manufacturing at a reasonable price. They also know that they will have options to choose the best fireplace or stove to fit their home's needs. For free standing direct vent gas stoves, the Z58AAF Roof Flashing with storm collar is needed for vertical installations. This 1/12 - 7/12 flashing has an 8 inch diameter and seals the vent lengths on a sloped roof. Proper installation will ensure a lifetime of use with the stove. Homeowners throughout the United States and Canada have trusted Kingsman Inc. with their fireplaces for over thirty years. When shopping with Kingsman, any homeowner knows that they will receive the best materials and manufacturing at a reasonable price. They also know that they will have options to choose the best fireplace or stove to fit their home's needs. For free standing direct vent gas stoves, the Z58AF2 Roof Flashing with storm collar is needed for vertical installations. This 8/12 - 12/12 flashing has an 8 inch diameter and seals the vent lengths on a sloped roof. Proper installation will ensure a lifetime of use with the stove. Homeowners throughout the United States and Canada have trusted Kingsman Inc. with their fireplaces for over thirty years. When shopping with Kingsman, any homeowner knows that they will receive the best materials and manufacturing at a reasonable price. They also know that they will have options to choose the best fireplace or stove to fit their home's needs. For free standing direct vent gas stoves, the Z58AF3 Roof Flashing with storm collar is needed for vertical installations. This flat flashing has an 8 inch diameter and seals the vent lengths on a sloped roof. Proper installation will ensure a lifetime of use with the stove. If you see rain often, then this Kingsman 5-Inch Inner Diameter Storm Collar is a good investment for your new fireplace installation. Storm Collars are useful for wetter climates as they divert water from vertical pipes to the flashing around. This Storm Collar will effortlessly snap around the vent pipe and fasten into place, providing you the peace of mind that water will not run down the vertical vent pipe into your home. This Kingsman Storm Collar matches the Kingsman 5"/8" vent systems. Kingsman Fireplaces has been creating beautiful and efficient fireplaces for homeowners since 1976. In addition to the lovely aesthetic appeal of a fireplace in the living area of your home, Kingsman also helps create chimneys which will take smoke from your fireplace to outside your home - so, you can enjoy the heat of a cozy fire without the smell of smoke. This Kingsman Z58VT Vertical Chimney Vent Termination is just one example of Kingsman quality. It's designed for 5/8" chimney pipes. In fact, it's just one of the many parts that make up the Horizontal Vent Starter Kit Collection for 5/8" Chimneys. A fireplace adds a cozy ambiance to your living area, especially during the chilly winter months. As you gather all the pieces necessary to create a safe chimney, don't forget to purchase an attic installation shield. This shield will protect your attic and roof from the heat that escapes through the chimney. Kingsman provides a variety of quality fireplace products and this Kingsman Z58AIS24 Attic Insulation Shield is no exception. The shield offers 24" of insulation designed to surround your chimney. Now you can enjoy a roaring fire in your beautiful fireplace and know that your home is safe from fire hazards related to your chimney. When the weather turns chilly and the evenings get dark early, it's fun to gather around the fireplace with family and enjoy the cozy glow. Whether you enjoy reading a book, working on crafty creations, or watching a movie or your favorite TV show, a fireplace lends itself to a cozy ambiance. 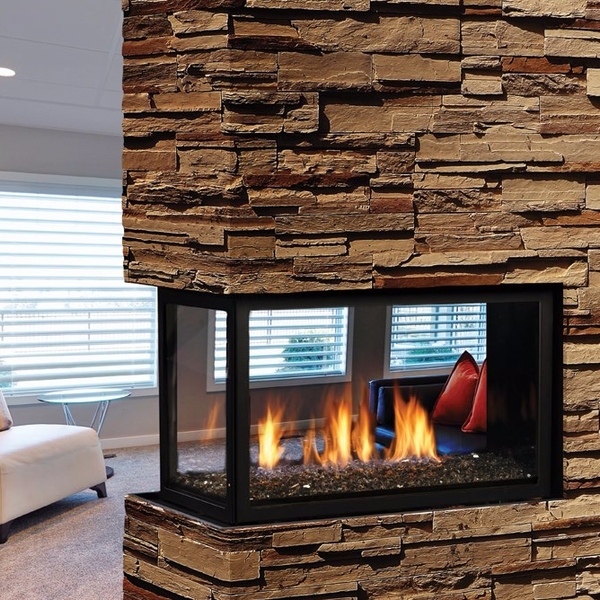 Kingsman Fireplaces has been creating beautiful fireplaces for homeowners for decades. This Kingsman Z58FS Chimney Vent Firestop Spacer provides space between the heat of the smoke going up the chimney and your home's construction materials. This piece is designed to be used as part of the Horizontal Vent Starter Kit for 5/8" Chimney Collection. When your chimney vent can use some extra support, Kingsman Fireplaces comes to the rescue! This Kingsman Z58RS Chimney Vent Roof Support is designed to be used with other pieces in the Horizontal Vent Starter Kit for a 5/8" Chimney. For years, Kingsman Fireplaces has brought homeowners high quality products for building beautiful and efficient fireplaces and chimneys. This Chimney Vent Roof Support is no exception! As you create the perfect chimney for your fireplace, this roof support can be a key factor in creating a strong chimney used to guide the smoke from your fireplace to the exterior of your home. For many decades, Kingsman has offered homeowners the advantage of beautiful fireplaces. This Kingsman Z58DFA Hard Chimney Pipe Adapter is just one item in the Kingsman Horizontal Power Vent Starter Kit for 5/8" Chimney Collection. These adapter parts are just one way that Kingsman caters to any home design. There are many universal parts for installing a fireplace in your home, but at times you need some unique parts that help the fireplace or chimney adapt to your home's unique shape and features. Now you can enjoy a beautiful fire in a beautiful fireplace that's designed to fit your home's unique features! This 3-Sided Kingsman Clean View Peninsula Direct Vent Millivolt Gas Fireplace, rated for use as a supplemental heater, is ideal for use on wing and partition walls. 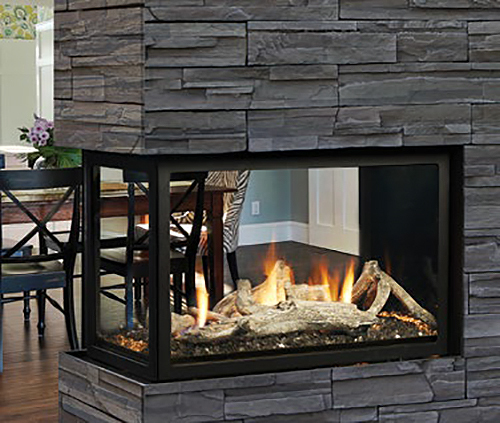 This fireplace is a direct venting fireplace, utilizing either a detailed 8-piece log set or contemporary glass media. This MCVP42H Fireplace comes equipped with a reliable standing pilot valve system, allowing operation in power outages, and with the millivolt valve, this fireplace pairs with a full line of wall switches or remote controls. This low profile fireplace frame allows a cleaner looking installation, and Kingsman includes safety barrier screens to prevent accidental contact with hot surfaces. BTU Input Ratings: 31,250 Natural Gas / 29,000 Liquid Propane. Efficiency Rating: 64.8% Natural Gas / 66.3% Liquid Propane. Front openings dimensions: 33 11/16" Wide, 20 5/8" High. End opening dimensions: 16" Wide, 20 5/8" High.